There is no set like it; nothing that even comes faintly near it. It is an extensive 47-piece suite of Chinese tea wares made entirely of filigree silver-gilt overlay, most pieces having a solid silver-gilt inner form. It was probably created in the latter part of the 18th century, the likelihood being that Canton was the place of manufacture. It remained hidden from public view, probably never ever having been used, for most of its life. It first appeared under the radar, so to speak, when, in 2011, Sotheby’s, Amsterdam announced a particularly special sale – namely the property from the estate of the late Queen Juliana of the Netherlands in mid-March that year. As the sale catalogue implied, no provenance could be found in the royal archives at the Hague as to how this set came into the Dutch royal household. Recent dialogue with the archive confirmed this. Some speculation in the description for Lot 398 alluded to a possible connection with Anna Paulovna, Princess of Orange, yet no real forensic investigation ensued at the time. In order to shed a more certain light on what is undoubtedly a highly important and probably unique collection of 18th century Chinese silver, forensics is the only logical route one can take. Anna Paulovna was born in the right century to have some connection with this tea ware, but her year of birth, 1795, makes little sense when applied to the style and obvious Chinese provenance of the set. She was the eighth child of Emperor Paul I of Russia and Maria Feodorovna [Sophie Dorothea of Württemberg], the Emperor being the only son of Catherine the Great and one whose fathering was a constant point of discussion [Sergei Saltykov, Catherine the Great’s lover at the time, was often considered the father]. Anna, meanwhile, became something of a hot potato in Europe in her mid teens having been turned down by none other than Napoleon, the future Ferdinand I of Austria and several other high-ranking notables until her brother chose William, Prince of Orange to be her suitor. The most obvious possible link to the tea ware in this already complicated European equation would be Catherine the Great. She not only had a passion for all things Chinese and was instrumental in bringing the Enlightenment to Russia, but she was known to have had a long-term ongoing correspondence with the Emperor Qianlong. Catherine also had a long-lasting obsession with the style that became known as the Chinoiserie. which was prevalent across much of Europe in the mid-18th century in parallel to Qianlong’s equal obsession with the Euroiserie style. 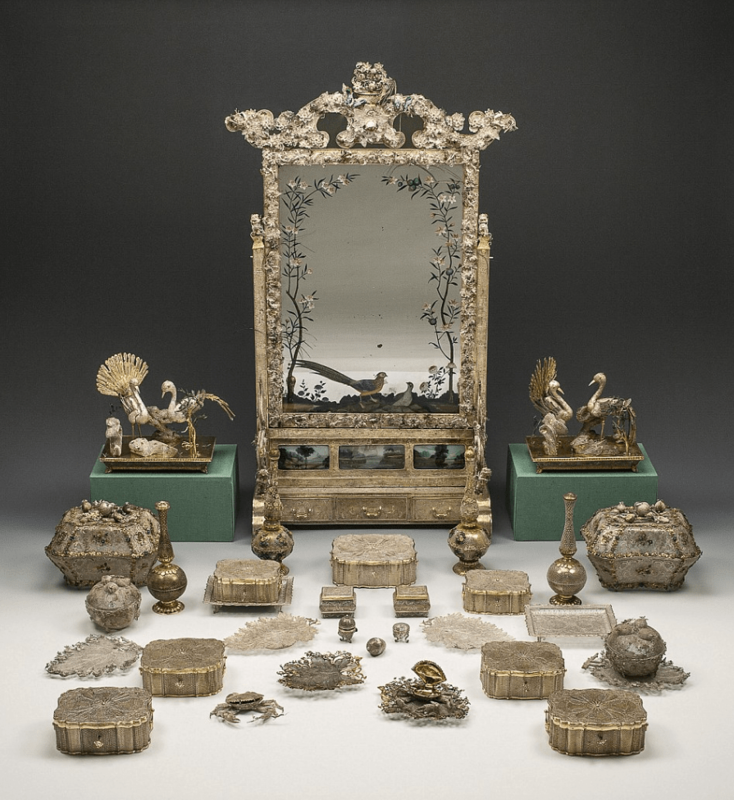 It is also known that Catherine the Great had an extensive collection of Chinese filigree silver-gilt accessories in her personal dressing room [above]; many of the items were a somewhat strange hybrid fusion of traditional Chinese and European baroque and rococo styles and motifs. The probable date of these items is circa 1765-70. Catherine also had a substantial Chinese Theatre built at Tsarskoye Selo and an elaborate Chinese bridge erected across the Krestovy Canal that led directly to it; she also had several entire rooms in the Chinoiserie style at the estate, so much so that together they became known as the ‘Chinese village’. green teas, they were a marriage gift to Paul and Maria Fedorovna from the Emperor Qianlong himself; a tribute gift, if you will. In the mid-18th century, the marking of silver in China [or at least in Canton, as opposed to the Imperial Workshops in Beijing] was not yet customary. In all the 2200 years of silver-making in China, there never existed a formal assay system or any obligation to mark silver. However, the most likely silversmith the tea wares could be attributed to is Bao Ying. He was also very likely to have been the maker of some, if not all, the items now to be found in the State Hermitage Museum in St Petersburg. 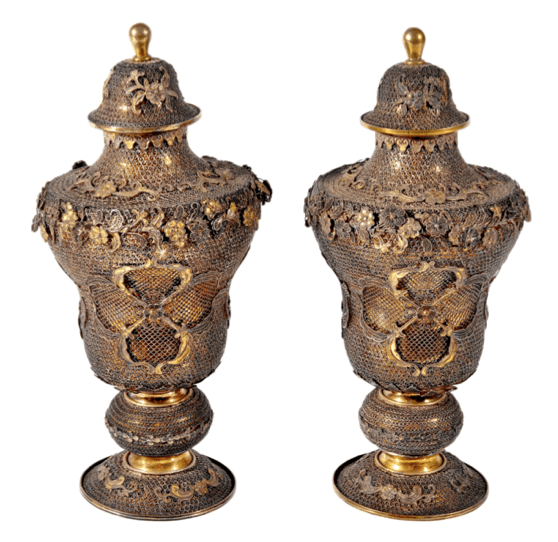 Several items bearing a somewhat primitive Bao Ying scratch mark are known to exist, including this pair of lidded silver-gilt filigree urns [above] which are again a fusion of the baroque and traditional Chinese; Chinoiserie is, in many ways, a somewhat schizophrenic stye. For some time it was generally considered that filigree work [myself included], in the context of China, was confined to the Qing Dynasty; this is not so. There are some fine examples of silver gilt and gold filigree items from the Ming Dynasty and much of it is clearly of a more masterly and robust workmanship than the items one can find in the 18th century in China. The Ming also made great use of the filigree technique in gold hair ornamentation [above], a style that re-emerged during Qianlong’s reign [immediately below] and much adored by the later Qing Empress Dowager Cixi as well as her penchant for extravagantly long filigree finger nail covers [below]. 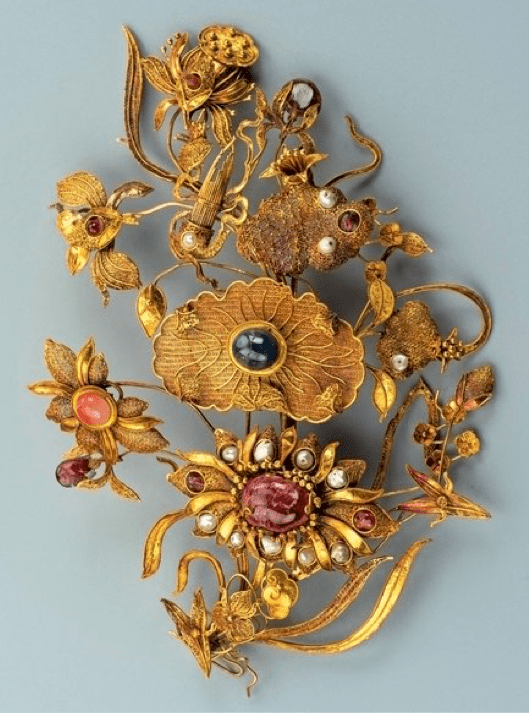 The use of silver gilt and gold wire-work is understood to have entered the repertoire of Chinese silversmiths and goldsmiths during the Yuan Dynasty [1271–1368 CE], the dynasty begun by Kublai Khan. This is now evident from the vast cache of burial wares found in tombs of Imperial families, their relatives and concubines. The fact the tombs are almost all in the Beijing area, the discovered tomb wares were all belonging to Imperial families and members of the nobility indicates strongly the items were probably made in the Imperial workshops or in workshops closely allied to them. Some bronze items that date from the Warring States Period [475-221 BCE] have silver and gold wire-work applied or inlaid. This strongly indicates knowledge of the method of wire-working being introduced to China from elsewhere and given the date span this is likely to only have come from the Middle East or from Persia, in particular Babylon/Mesopotamia. 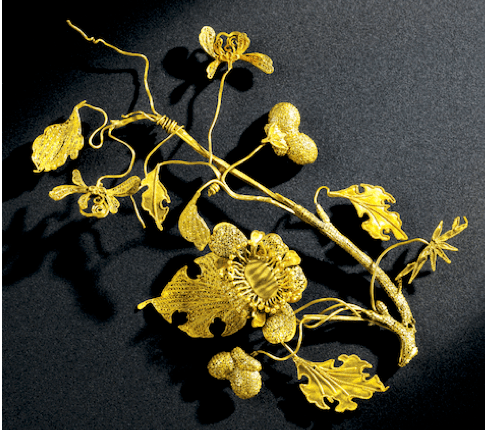 The items found during the Ming Dynasty are often studded with gem stones and precious jewels, indicating a significant increase of sophistication of the art of wire-working by Chinese artisans. All these techniques strongly demonstrate that such items incorporating them had a strong link to the fashion of the time among the upper strata of Chinese society; fashion almost always influenced gold and silverwares and not vice versa. What is probably even more significant is the appearance of such items in parallel to the development of Beijing as the Ming capital, instigated by the Yongle Emperor [1402-1424 CE]. Making Beijing the capital also included establishing it as the political centre of China as well as the centre for the development of culture and economics and by default, sophistication. Soon after marrying, the relationship between Catherine and her daughter-in-law soured; she kept the couple as far away from politics at the court at Paul’s private estates at Gatchina, while Catherine could devoutly follow her own aspirations for ever more power. Paul and Maria Feodorovna did eventually succeed to the throne in 1796 upon Catherine’s death from a stroke, he becoming Emperor and Autocrat Paul I of all the Russias. 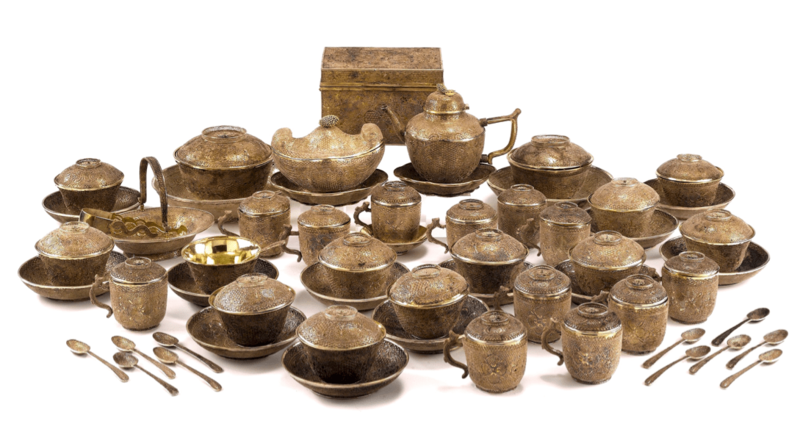 The tea wares, as yet, still probably remained unused; tea drinking at the Russian court in the late 18th century would not have involved the use of Chinese cups. Russia was, however, dependent on tea coming from China, the 1727 Treaty of Kyakhta between Russia and China greatly increased the number of tea-bearing camel caravans being traded at the border and by Catherine’s death, in excess of 3 million pounds [1.36 million kg] of tea was being imported annually from China. It was highly likely a camel caravan brought the tea wares to Russia, or at least to the Sino-Russian border post at Maimenchan/Kyakhta. Her Imperial Highness Grand Duchess Anna Pavlovna of Russia was betrothed to William, Prince of Orange in 1815 during a visit he paid to St Petersburg. 1 million roubles was settled as being the dowry, by her mother, now widowed. The wedding took place on 21 February 1816 at the Chapel of the Winter Palace at St Petersburg according to the Russian Orthodox tradition. Part of the betrothal agreement was categorical that their children would be raised as Protestants, while Anna Paulovna was allowed to remain Russian Orthodox. Their marriage was celebrated by Alexander Pushkin by his composing a poem entitled “To the Prince of Orange” – said to have been his first fee-paying oeuvre and possibly the beginning of his life-long passion for the colour orange. 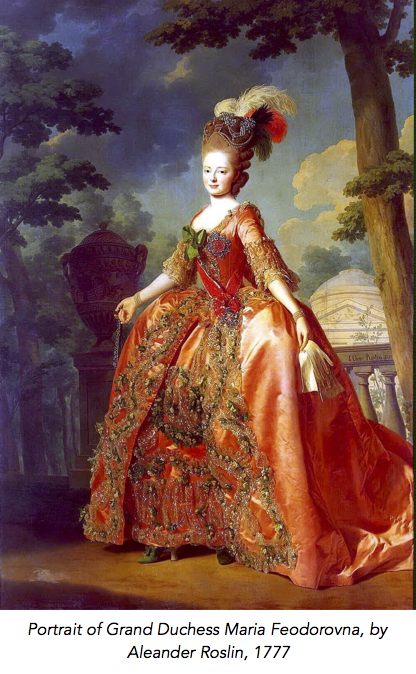 Anna assumed the title Her Imperial and Royal Highness The Princess of Orange. 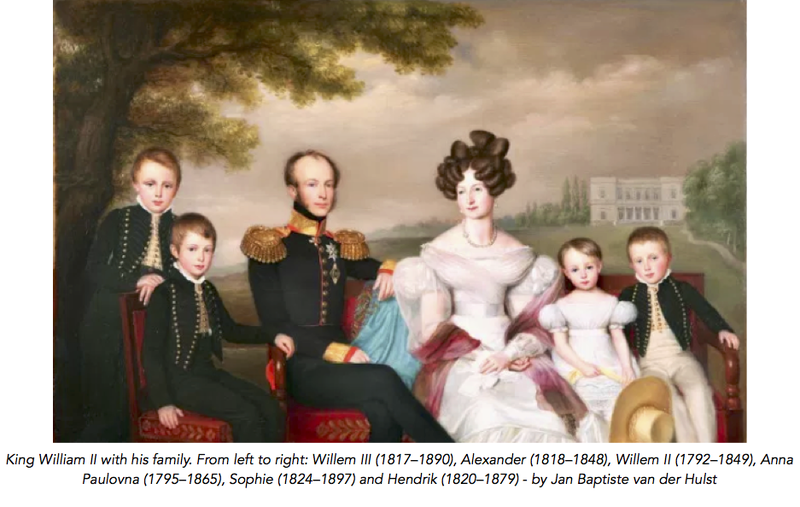 In 1817, the couple returned to the Netherlands, where Anna Paulovna found a far more egalitarian society than St Petersburg, which was never to be to her liking. It is more than reasonable to assume that it was then the Chinese tea wares found their way to the Dutch court. When William became king, Anna became Queen Consort of the Netherlands, Grand Duchess Consort of Luxembourg, Duchess Consort of Limburg. The royal house was hence known as the House of Holstein-Gottorp-Romanov. It has been said of Anna Paulovna that she remained a Russian Grand Duchess more than she ever became Queen of the Netherlands! The French and the Dutch preceded the English’ mania for tea-drinking. The Dutch tended to have some thee (a French word pronounced “tay”, even though they began their history of tea drinking using the Cantonese word cha). Orange Pekoe tea, a high grade tea, originated with the Dutch. It is said that on introduction to the House of Orange, they called it “pecco” – the word supposedly derived from the Amoy (Xiamen) dialect word for a tea in China known as pe-ho or pih-haou [“white down’, 白毫]. Thus the name “Orange Pekoe,” came into being in Europe, giving it an allusion of being a “royal” tea. The tea wares left the royal court in 2011, having been sold at Sotheby’s for €204,750; the entire sale realised almost €7 million, the proceeds being given to charity on the stipulation of Her Majesty the Queen and Their Royal Highnesses Princess Irene, Princess Magriet and Princess Christina. This, in my opinion, is the most logical deduction for a complete provenance of this important collection of Chinese silver tea wares. Adrien von Ferscht is one of the only academics actively working on research of Chinese export silver of the Qing dynasty; research that is carried out within the context of the 2200-year history of Chinese silver-making. He is an Academic Committee Member of the Academy for International Communication of Chinese Culture at Beijing Normal University and is a Lead Researcher at Tsinghua University, Beijing. His Definitive Collectors’ Guide for Chinese Export Silver is widely used by auction houses and dealers around the world. His academic home base is Glasgow. 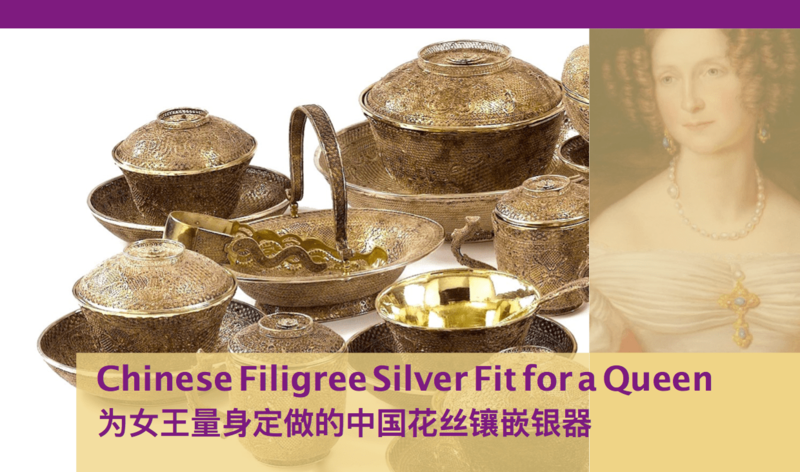 This article is written expressing a personal understanding and opinion formed through a focused forensic search of relevant historic facts related to the people involved in the historic timeline of this particular set of silver and a more deeper understanding of Qing Dynasty silver in terms of style and manufacturing based on ongoing research of the author, now in its 8th year.